The fireworks were saved. 17% of Metro’s service? That might be doomed. The transit agency faces a $75 million annual shortfall and service cuts of up to 600,000 hours beginning in fall 2014 unless new funding becomes available. The committee wants the public to have an opportunity to tell their leaders how transit service cuts, expected to begin in 2014, will affect them. Absent action from the state legislature, King County will begin seeking input this fall on how to cut 600,000 hours of transit service. 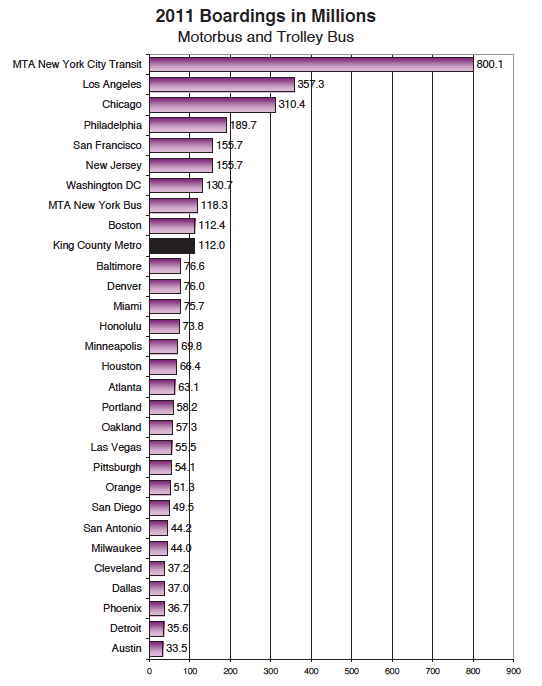 A 17 percent reduction in transit service would result in fewer travel options, longer travel times, more crowded buses, and more traffic congestion – impacts that could touch virtually all King County transit riders and many commuters around the region. Based on its service guideline policies, Metro has identified 65 routes at risk for elimination and 86 routes at risk for service reductions without a sustainable source of funding. Since 2009, when revenues declined sharply, Metro has been able to avoid these cuts through $798 million in efficiencies, staff reductions, fare increases, reserve spending, and additional revenue. The implementation of the Congestion Reduction Charge (CRC), a temporary charge on vehicle licenses for two years, helped Metro avoid deep transit service cuts in 2011. 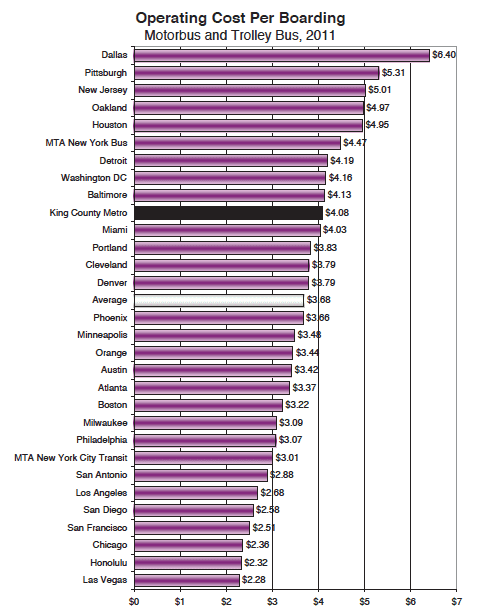 By law, the CRC must end in 2014 and without a new source of revenue, Metro must reduce service. The list of threatened cutbacks, reductions — and eliminations — for the Capitol Hill area and central Seattle have been added at the bottom of the post. Only one on-Hill route appears to be a possible target for elimination. If the threatened Metro belt tightening occurs, say goodbye to Harvard Ave’s Route 25. A long list of Capitol Hill-crossing routes could see a reduction in midday and peak service, documented below. Officials said Monday that funding shortfalls could mean Metro faces up to 65 routes eliminated and up to 86 routes potentially reduced and revised — about 40% of the system. The release of the threatened cutbacks comes as legislators in Olympia consider a statewide transportation funding package. 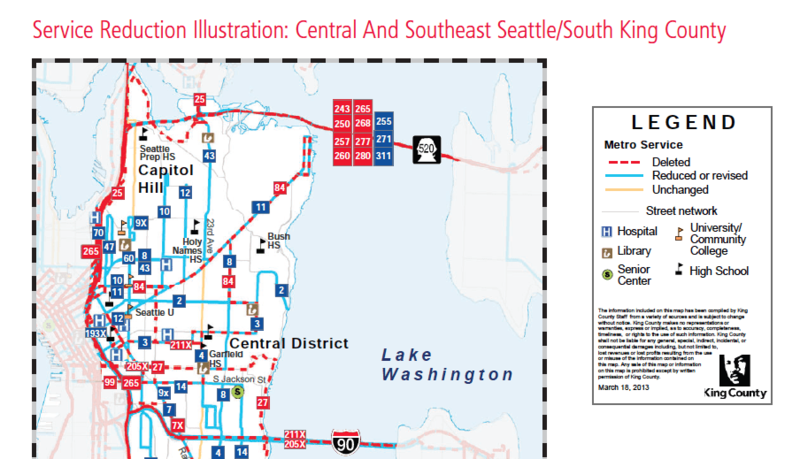 We’ve also embedded Metro’s annual report to be presented to the King County Council Monday afternoon, below, for an in-depth look at the transit service, the opportunities it provides and the challenges it faces. This entry was posted in News, etc. and tagged transit by jseattle. Bookmark the permalink.